It is no secret that the more emails you have on your PC the more likely you are to get confused. You can simply get lost in your business correspondence. This can duff up your business very badly. Total Outlook Converter Pro will save you all that trouble. With this versatile tool at hand, you can convert your messages to Text in a matter of seconds and group them in a separate folder in your chosen order. Thus you will know where a message lies when you need it. 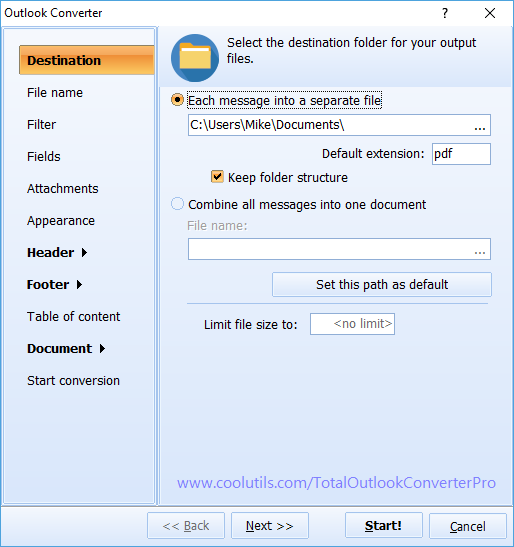 This Pro version of usual Total Outlook Converter allows you to convert emails with attachments to text and save attached files either as separate ones or as part of the message you are converting. Featuring a clear and easy-to-follow interface and a highly functional wizard, it poses zero difficulty for even newbies. 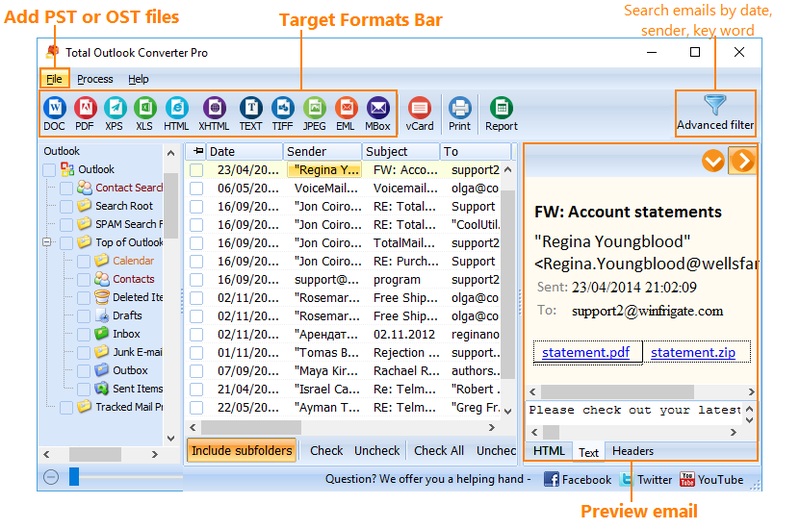 For those who are not sure if what we say is true, there is a free 30-day demo version of Total Outlook Converter Pro. You can download it for free and spend a month converting Outlook emails with attachments. Everyone can use this program, regardless of experience. The procedure is quite standard and is defined by the interface and the wizard. First, the user should find the folder with messages using the folder tree and click on it. Second, he/she should check the messages meant to be converted. Third, one should adjust file settings using the wizard. Total Outlook Converter Pro has fewer wizard options than Total Outlook Converter. These include destination, file name, fields and attachments. Appearance, headers, footers and document are not featured in the Pro version. Destination offers you to specify the folder, in which your text files will be saved . 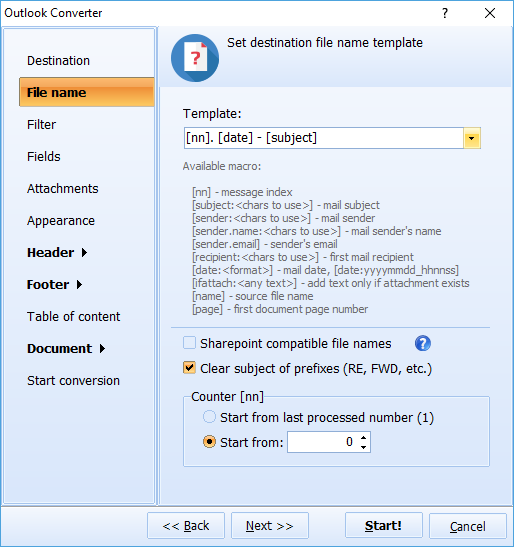 File name provides a template, according to which a file name is constructed. Fields option offers you to export email fields according to your preferences. For example, you can choose to export sender, recipient, date, body, subject, etc. Attachments are a group of options, by aid of which you can save attached files either as separate ones or leave them incorporated in messages. Also, you can choose to unpack archived attachments. Last thing you should do is confirm your choice of settings by pressing the "Start!" button. This will launch conversion. If you have used the free demo version and would like to buy the license version, you can do it immediately. 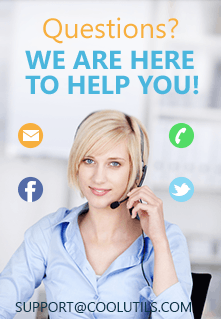 You will be receiving free tech support for one year from purchase date.